What options will you have with a degree in mathematics? It is worth noting that approx. 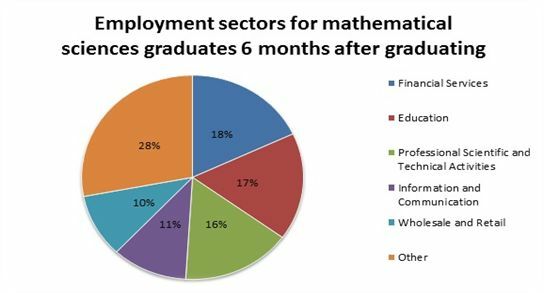 80% of the top graduate recruiters do not specify a degree discipline - analytical and problem-solving skills are developed to a very high level on a mathematics degree and these skills are very transferable, so you can also realistically also consider a career in non-finance related sectors. A number of Warwick mathematics graduates have successfully developed careers in meteorology, the games industry, software, the arts and the media and data analytics, for example. What impact will module choices have on my career plans/options? If you are worried about how choosing your degree options might affect the choices open to you after graduation this may not have as much impact as you think. Generally speaking there are many factors that employers consider before they start looking at the way your degree was structured. They are interested in your motivations and interests and why you've chosen a particular career. Option choices can help here, the Challenges of Climate Change module, for example, would indicate commitment and enthusiasm to an employer in the renewables sector. For some careers, your general level of academic attainment is important and if you want to enter one of these, it would be a shame to jeopardise a 2.i by choosing an unknown area of study that you might find overly stretching. The key message is: if you know what career area you want to enter, option choices are one way to prepare for this and you might want to discuss them with your tutor or a careers consultant. However, if, like many, you have a very open mind as to your future area of work, choose options that you will enjoy and that will hold your interest as these are the ones where you are most likely to find the motivation to work hard and do well. What advice and information is available through the universities Careers & Skills Service? - Academic support is also available through the Skills team, you may want to develop your study skills, your time management skills to prepare for assignment deadlines or to prepare more effectively for examinations and dissertation writing, for example Skills. Don't leave your career planning until your final year though. You are welcome to visit the Careers Service at any time during your academic career. We are happy to see you if you have no idea or lots of ideas about what you want to do next. For those of you looking for career inspiration the Careers Hub and Weblink online resources hold information on a wide range of jobs and you can try your hand at the computer based `Prospect Planner' to generate career ideas - see www.prospects.ac.uk. We may also run specialist appointments for maths students – see our Website for information about how to make an appointment. Second year students in particular: to continue onto the third year of the MMath you need to reach a certain standard at the end of the year. Many of you who are currently on the MMath will not be by the end of year 2 so if you did not get a first in year one there is a strong possibility you could be in your penultimate year now! Undertaking Volunteer projects can also develop essential transferable skills such as communication, teamwork and project management. Please visit www.warwick.ac.uk/volunteers to access the Warwick Volunteers site. Possible projects include student mentoring, student tutoring, Kidz Kamp and many more. During the forthcoming academic year, there will be a range of events and sessions relevant to maths students and the careers consultant who works with maths will be available in the department at times throughout the year for appointments (although you can also make appointments throughout the year at University House). Look at any recruitment advertisement for graduates and you'll see what they want. Yes, of course they want the applicants to have a good degree, but they want to see good transferable skills as well. Transferable skills? Things like really good communication skills, team-working, negotiation and persuasion, resilience, initiative, planning and organising and problem solving skills. That's just an example of the sort of generic skills, that can be adapted to many different types of workplace, that employers are demanding today. You can develop your skills in a number of different ways. Firstly, through your studies - mathematicians have good analytical skills, will think logically and be good at solving problems. Secondly, think about how work experience can develop things like team-working, dealing with people, multi-tasking, drive, initiative and taking responsibility. Getting involved in other extra-curricular activities like clubs and societies will also give the opportunity to develop and demonstrate those skills that the employers want to see.